Pet Products spending totaled $45.87B for the 12 month period ending 6/30/17. This was an increase of $2.41B (+5.5%). Total U.S. spending for the period totaled $7.58 Trillion, up $320B (+4.4%). Driven by a big increase in Supplies, Pet Products Spending exceeded the pace of Total U.S. spending. In this report we will update Pet Products Spending for arguably the most popular demographic measurement – by Generation. Baby Boomers built today’s Pet Industry, but they are getting old. What happens next? Most of the conversation revolves around Millennials. They are obviously the future but they are still young and a long way from spending “maturity”. This means that we can’t ignore the Gen Xers. They don’t get much publicity but they are next in line to the Boomers. The numbers come from or are calculated from data in the US BLS Consumer Expenditure Survey. First, let’s define each generation and look side by side at their share of Consumer Units (H/H’s) and Total Spending. Boomers are still the largest group with 44.9M CUs (34.8%) and the biggest spenders – $2.8T. Their numbers are flat but their spending continues to grow and is over performing as their share in relation to their share of CUs is 106%. Gen X is the second largest CU group. Their overall numbers are down slightly as more singles “pair up”. They also had a minuscule drop in spending. However, they spent $2.4T and they had the best spending performance 118%. Millennials are the largest generation in sheer numbers, but third in CUs. More are developing financial independence as CUs grew by 2.3M. They also had the biggest increase in spending +$182B. Their total spending was $1.5T – 3rd place. However, their spending performance vs share of CUs is 85%. They still have a ways to go. The Silent generation lost numbers, primarily due to death and movement to assisted living facilities but their overall spending was flat. This means their spending per CU was up slightly. The Greatest Generation will soon be too small to be a measureable, separate spending group. There is the obvious difference in age to be considered and differences in behavior. However, we have also learned that there are key Consumer Unit characteristics, like income, family situation and home ownership that make a difference both in Total Spending and in Pet Spending. Let’s look at some of these key differences. The size of the CU and number of children is all about Family responsibility and all the financial pressures that this generates. The CU size overall is unchanged from Mid-2016 and still peaks with the Gen Xers. However, the Boomer and Silent generations decreased by 0.1 person. Married couples with children under 18 are an important segment, 23% of all CUs. They account for 27% of all Pet Products spending and 29% of Supplies Spending. However, as the number of children grows, the increased financial responsibility can slow Pet Spending. Boomers still average 2+ people in the CU. However, they are much less likely to have children <18 at home. As their human children leave home, they turn their attention and spending to their Pet Children who are still with them. Pet Products spending is also tied to the number of earners in a CU. 2+ Earner CUs account for 41% of the total but they spend 53% of Pet Products $. As you can see the “earning” is being done in America by Gen Xers, Millennials and Boomers with Gen Xers at the top, as to be expected. Homeownership – Owning and controlling your own space has always been a key to increased Pet Ownership and spending. Homeowners currently account for 78.8% of all Pet Products Spending, which increased by $1.7B (+5%). However, Renters’ spending was also up $0.7B (+8%), which shows the growing influence of the younger groups. Nationally, Homeownership showed a slight increase from 62% to 63%. Gen Xers remain at or near the national average. Homeownership continues to increase until we reach the oldest Americans. The Millennials are obviously lagging behind but they did increase from 32% to 34%, which is encouraging. Boomers also moved up from 75 to 77%. For the record, the homeownership rate for the over 25 Millennials remains 20% below the rate for the older generations when they were the same age. Income – The 37>52 year old Gen Xers are the leaders. The Boomers earn about 16% less and their income will continue to fall as they age. The big drop occurs with the Silents as retirement becomes almost universal. The Millennials income is still 20% less than the Boomers and only 67% of the Gen Xers. Total Spending – The Gen Xers make the most and spend the most but it’s not out of line with their income. Boomers also spend more than the average but their income can still support it. Spending doesn’t fall as fast as income with the older generations. In fact, they are actually deficit spending in relation to their after tax income. The Millennials under 25 are also in an after tax income deficit spending situation. However, the rising income from the 25>36 group makes up the difference and brings overall generational spending in line with income. Avg CU Pet Products Spending – The Boomers have been alone at the top since they made the move to upgrade to Super Premium Food in 2015. However, their lead began dropping once they began value shopping for food. The Millennials trail the Gen Xers by 37% and the Boomers by 44%. The Gen Xers made the most significant move in Pet Products spending as they broke the national average for the first time since 2014. At that time they were in a tie for the lead with the Boomers. Both were spending at 113% of the national average. Pet Products Share of Total Spending – One measure of the level of commitment to their Pets. Only Boomers exceed the National Average but everyone under 90 years of age is at least 85% of the national average. Pet Parenting is a lifelong commitment. Another key point is that the Gen Xers were the only group to increase their pet products spending in terms of its share of their overall spending. This takes on even more significance when you consider that this group makes and spends the most money. Millennials are in third place in both income and total spending but they fell to 4th place in this measurement. Much of their Pet Products spending growth was due to an increase in CUs. You can see that spending dropped significantly for the very Oldest, “Greatest” Americans but the 72 to 89 year old Silent Generation is still making “noise” with their commitment to their pet companions. Now let’s look at Pet Products $ spent by Generation and their share of the total. In terms of 2017 Mid-Yr Performance, it was all about the younger groups, especially Gen X – Up $2.33B. Boomers still have the largest share but it is down and is now less than the combined share of Millennials and Gen X. They began a comeback in the first half of 2017. – Jul>Dec 16, Down $2.34B; Jan>Jun 17, Up $1.66B. Unlike the Gen Xers, 2/3 of the Millennials’ gain came in 2016. – Jul>Dec 16, Up $0.58B; Jan>Jun 17, Up $0.33B. The overall decrease came from a reduction in CUs. Jul>Dec 16, Up $0.12B; Jan>Jun 17, Down $0.20B. The Pet Products $ increase was primarily due to the Gen Xers. Let’s look at individual segments. First, Pet Food..
Boomers once again have the largest share but it has dropped significantly from a peak of 52% in 2015. 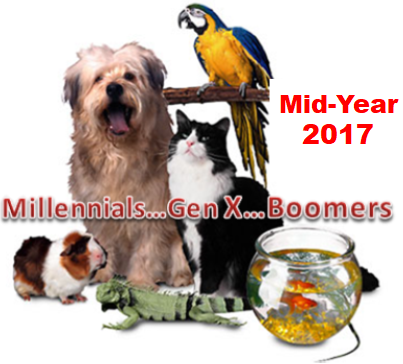 Gen X has 14% more CU’s than the Millennials but spent 70% more on Pet Food. Their spending lift came in 2017. Millennials spent $0.86B more on Food Mid-Yr 2017 versus 2016 but the increase was all in 2016. July>Dec 16 (-$2.81B) – Value Shopping; Jan>Jun 2017 (+$0.93B) – In 2017 they started a comeback. Jul>Dec 16 (+$0.87B); Jan>Jun 17 (-$0.01B). Much of the lift is coming from a big increase in CUs. However, we could be seeing the start of a new food trend. The Millennials pioneered the move to Super Premium. Greatest Gen. – Ave CU spent $57.89 (-$5.84); 2017 Mid-Yr Food spending= $0.09B, ↓ $0.03B (-25%)- fading. Boomers still have the largest share but unlike Food, the Younger Groups – Gen X and Millennials control 51.6%. The lift is consistent and widespread. Plus, there was an exceptionally great start for 2017. Their momentum faded in 2017 but still an increase in both halves. Jul>Dec 16 (+$0.14B); Jan>Jun 17 (+$0.02B). There was a steep drop in Supplies spending in 2015 as consumers upgraded to Super Premium Pet Food. By the first half of 2016, Supplies spending flattened out as consumers shopped for price on food and used some of those saved dollars for Supplies. The spending lift which began in the second half of 2016 crossed generational lines, especially from age 37 to 89. However, the biggest drivers were the Gen Xers and the Baby Boomers, who accounted for $2.42B (93.4%) of the total $2.59B increase. In the final chart we will compare each generation’s share of spending on Total Products, Pet Food and Pet Supplies to their share of CU’s and see “Who is earning their share?” Then we will review their actual performance numbers. 100+% indicates you are “earning your share”. If a share of market is outlined then performance exceeds 100%. Greatest Generation – is not included in this section as both their market share and CU share are too small. This group ranges in age from 72 to 89. Pet ownership is more difficult after age 75 and this is reflected in the low share of Pet Products spending. However, the desire and the commitment are still there. This is evident in the 70.9% performance on Pet Food, which beats the Millennials by a “nose”. The Boomers truly led the way in building the pet industry and they are still at it. They are earning their share and are the spending leader in both Food and Supplies. Their performance is down from last year and it will continue to fade as they age. However, based upon their history, they will continue to perform well for many more years. The Gen Xers are next in line and next in performance to the Boomers. They outperform the Boomers on supplies and now their food performance also exceeds 100%. Plus, there is more “good” to come. Gen Xers range in age from 37 to 52. They already make and spend the most money. As they fill up the 50 to 54 age group and move on, their children will start to move away from home. Their focus will then turn to their Pet Children. Expect their performance to continue above the 100% level and to surpass the Boomers, perhaps within the next five years. The Millennials are widely touted as the future of the industry. This is ultimately true, but the future is still a ways off. The Millennials are currently 18 to 36 years old. They have pets, a lot of them, but their responsibilities are growing and money is still in short supply. They have been spending a lot on Supplies as they are establishing Pet households and actively seeking products that make Pet Parenting easier. This year they swapped out some of those Supplies dollars to spend on food. One thing is certain. Value shopping is their golden rule, especially on the internet. They are 18 years away from occupying the highest income age group. Plus, since they are having children later, the spending lift from children leaving will undoubtedly be delayed. We’ll keep a close eye on them, but realistically, they are 20 years away from being the dominant force in Pet Spending. A Final Word – There’s no getting around it. In terms of Pet Products Spending, the 12 month period from 7/1/16 to 6/30/17 belonged to the Gen Xers. They produced $2.33B of a $2.41B increase with a strong performance in both Food and Supplies. They also “more than earned their share” in both segments. They stand next to the Baby Boomers and it appears that they are ready and able to ultimately take their turn at the top of Pet Products spending pyramid.